These are some postcards I got from the Salvation Army thriftstore, it is a 5-piece set made by Ikea. I don't know what Chinese painting has to do with Ikea but they are so adorable and such a great find for a nice price too =). They are painted by Chen Dehong, a renowned chinese painter who mixes Chinese and Western methods of painting. 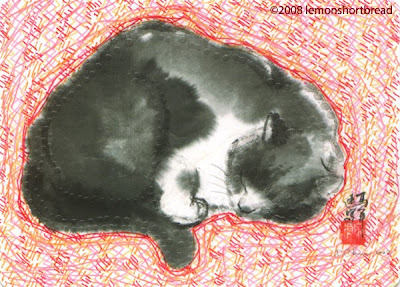 Love the dexterity of the strokes, and how a few dabs and smudges portrays kitties so well. 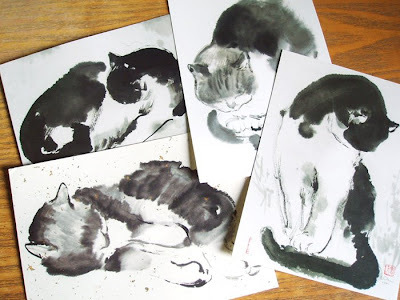 I've always planned to take up chinese calligraphy/ painting but learning the technique takes years of practice; the simpler the artwork, the harder the technique. Also I'm guessing since handling the brush & ink will show how amateur (or pro) you are, it's just better not to get embarrassed because my chinese handwriting in pen is atrocious. I love the detail in the postcards, its almost as if the cats are real. I don't know how I would have altered them if it was me.